Science and environmental productions would be as dead as last years’ salmon run without quality, supportive natural audio. Yet despite its vital role in almost every aspect of higher-end outdoor filmmaking today, it remains one of the most overlooked and abused aspects of making your outdoor media come alive. That’s one reason why having a quality library of natural sounds can sometimes separate both you from the competition. Natural audio (nat audio) is the combination of the natural sounds that occur in an outdoor environment. It can include ambient wind noise as moving air contacts leaves, tree branches and a variety of surfaces. Nat audio commonly also contains bird sounds, insect background and intermittent animal sounds such as bugling elk or chattering squirrels. It can even include other sounds in nature such as rushing or lapping water, thunder, rain or even sleet. Although some might consider all outside sounds as part of the “natural audio” world, the true sounds of nature are more often than not contaminated with a host of human related sounds that degrade its essence and production value of true nat audio. Unless you’re recording in the wilds of the Yukon or the heart of Africa, nat audio is often degraded by passing airplanes, distant traffic, barking dogs, chainsaws, gunshots, ATVs, watercraft, construction pounding, marching bands, yelling kids, you name it. More often than not, natural audio is captured serendipitously as part of some grander enterprise such as videotaping your environmental production. And because it’s “background” audio to another prominent event involving people, it’s also “contaminated” with camera operator motion and voice sounds and talent sounds. Of course, some of those sounds are not only unavoidable but crucial to the overall production. The host’s audio on camera is a lot more important to the value of the production than a cricket chirping. However, knowing how to minimize contamination from all sources and how to maximize the capturing of uncontaminated audio is the art of capturing nat audio that can boost the quality of a production while helping make it seamless. Use a quality shotgun mic instead of the built-in mic. If your shotgun mic has various settings, use the “normal” and not the “tele” or high setting. You’ll capture too much white noise and fuzzy ambience. If your camera already has a quality shotgun style mic that is somewhat segregated from the camera body, that’s fine. Just be sure you set the volumemanually for the softer tones of capturing nat sound. Birds don’t sing as loudly as people talking nearby. Use headphones. Most audio glitches on field tapes can be attributed to not wearing headphones and falsely assuming everything is fine with the audio that’s being recorded. Using headphones and watching your audio meter (if your camera has one or more) will allow you to adjust the manual setting on the audio to capture just the right amount of natural audio without introducing white noise. Leaving the setting on “auto” will allow the camera to automatically boost the audio setting because it wants to hear something in the –20db range. Most nat audio is far below that range so the camera will automatically boost the setting so high that it will introduce white noise plus pick up excessive camera noise. Yes, you’ll get nat sound alright, but it will be awash with camera hum and white hiss. Most shotgun mics come with a foam covering intended to muffle slight wind noise. However, the exposed foam is susceptible to moderate to gusty wind, rain drops, sleet and brushing against vegetation. Good wind muff socks abound at audio supply outlets or you can simply use a fuzzy foot sock to slip over the mic. Okay, so now you’ve got the right gear, how do you use it effectively? 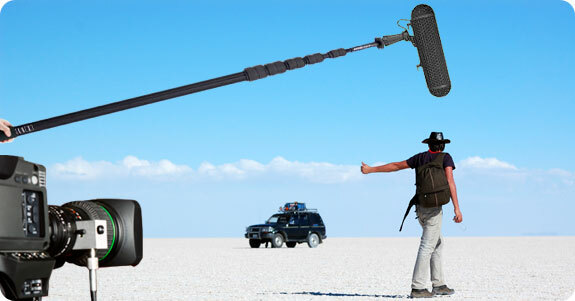 Even though some camera setups take advantage of one channel of audio devoted to the wireless mic of the talent’s voice, while the shotgun mic is usually dedicated to capture ambient sound, another separate nat sound track is crucial in studio editing to make all the production cuts seamless using background audio. And that requires purposefully planning and capturing nat audio without distractions or contamination. It’s unrealistic to start hearing a frog croaking during a videotaping segment then tell the host, “Quiet on the set, I hear a frog”. True, the frog croaking at the right times could boost the richness of the audio track but the frog really needs its own, “uncontaminated” sound track. Like any quality endeavor, plan ahead to capture quality natural audio. In most places, this means recording when and where human generated noise contamination is at a minimum. Weekdays, dawn, dusk, and remote all fit into the possible mix. This may mean getting up early and staying up late, but you’ll soon find your quality library of nat sounds growing in leaps and bounds. And for loons, whippoorwills, lions, owls and such, you may even try the middle of the night, or at least within the first hours of darkness. Once you’re setup in a location with some cool nat audio occurring, minimize any camera noise by taking the shotgun mic off the camera (if the cord permits) and secure it (Velcro quickstrips) pointed in the direction of the best sounds. I use a cord that lets me secure the mic about two feet in front of the camera on a sapling or tree branch. Using this technique you shouldn’t get ANY camera noise. Setting on a flat rock or near clam water will allow those surfaces reflect the sounds into the mic. Now set the camera down or on a tripod to minimize any camera or cord movement. Start recording and step back a few paces (as long as your headphones cord permits) and sit or stand perfectly still. I’ve heard lots of would-be attempts to capture cool nat audio ruined by someone trying to “quietly” handhold the camera while they swatted bugs or sniffled their nose. Morning bird ambience – doves, oxpeckers, louder sand grouse chatter. Wind ambience – slight breeze. Moderate breeze. wind trees, wind grass, wind scrub. Specific sounds – Cape buffalo grunting, elephants trumpeting, hippos bellowing, fish eagles screaming, monkeys chattering, wildebeest grunting. Water related sounds – river water rushing sounds, close and medium range. Next to water, up on riverbank. Reverse the above list from midday to dusk and after. Unlike most “natural” audio, native voices or songs – such as a Maasai tribal dance could also be a valuable asset to add to the list. So what’s the big deal with messing with all this nat audio? I had a client recently give me some HD tapes of two very intense wildlife encounters with Cape buffalo that he wanted produced. I was shocked to find out that after I took the job that three hours of the crucial cape buffalo tapes had NO FIELD AUIO whatsoever. Fortunately, I had collected a significant nat audio library of African sounds over the years. So my challenge was to seamlessly recreate nat audio to match the action wildlife sequences that were missing audio. The end result was a finished production where even most pros couldn’t tell that all the nat audio had been dubbed in. So having a good nat audio library plus a few editing tricks saved the day on that job that some producers may have tossed on the editing room floor. I totally just read this article 5 times Zach. You are the man. Big thanks man. Really useful and practical information on here.